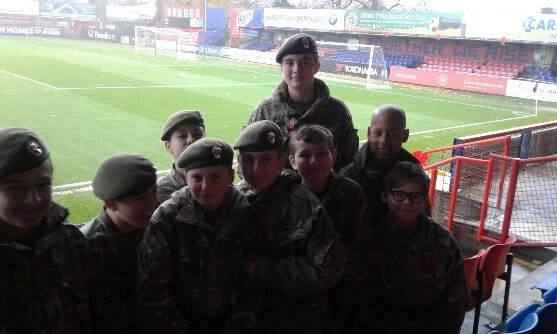 On Saturday the cadets went to Aldershot Football Club to support as ball boys and girls. When we arrived at the football pitch we were given a briefing about what we were doing. We were told that we would be collecting the balls for the players if they left the pitch at all. So when we went on to the pitch we were given flags to hold as we would be raising them as the players were entering the pitch for the game and 2 minutes silence. When the players were entering the pitch we raised the flags for them and it started to rain. After the 2 minutes silence we spread out along the edge of the pitch so that we could get the ball if it left. We got drenched during the first half and were given waterproofs for the second half. 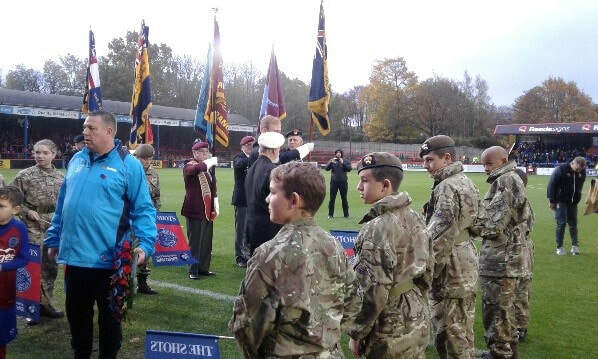 The match ended with a 1-1 draw between Aldershot FC and Bradford city. ​After the game, we were invited to the lounge with all the important people by the chairman. When we got to the lounge we were offered tea and coffee and we were all given time to warm up and dry off a bit. During our time in the lounge we experienced all the awards being handed out to the players. After that we went back to the mini bus so that we could get home. 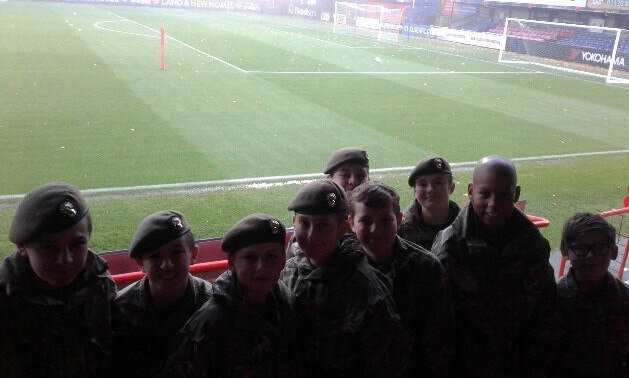 The football match was a really fun experience for us all and I think it really brought out a different side to some of the cadets that came with us this Saturday. I think that doing more things like that will benefit us all a lot and I think the opinion of the cadets that went will influence other cadets to try and sign up and participate with the extra-curricular activities that we are offered within our cadet contingent.